'Ripeness is all', said Shakespeare. Josephine MacLeod, more fondly remembered as Tantine and Joe, rephrased the dictum as 'Readiness is all'. Readiness, indeed, was the vibrant slogan of her highly colourful life. She was ever ready, she readily rose to every situation. Born in an affluent family in a northern state of America, and inheriting a strong spirit of freedom and adventure from her Scottish ancestors, she vigorously sought the Truth that liberates. Her tryst with destiny came in January 1885 when she attended a New York meeting addressed by Swami Vivekananda who had already become famous as an orator by divine right. His clarion call overwhelmed her, it had the unmistakable ring of truth. As she listened to him for the next seven years whatever he uttered was truth to her. She became his staunchest friend, and she would not call herself his disciple. She did everything to make his stay and tours in the West comfortable and she introduced him to some of the most celebrated men and women of the time. Swamiji in turn gave her enormous spiritual strength and his letters to her are classics. To spread Swamiji's message of the potential divinity of human being because Tantine's life's mission. When she asked Swamiji what she should do, he gave her the mantra 'Love India'. And till she passed away at the ripe old age of ninety she devoted herself, heart and soul, to loving India and serving India in all manner of ways. 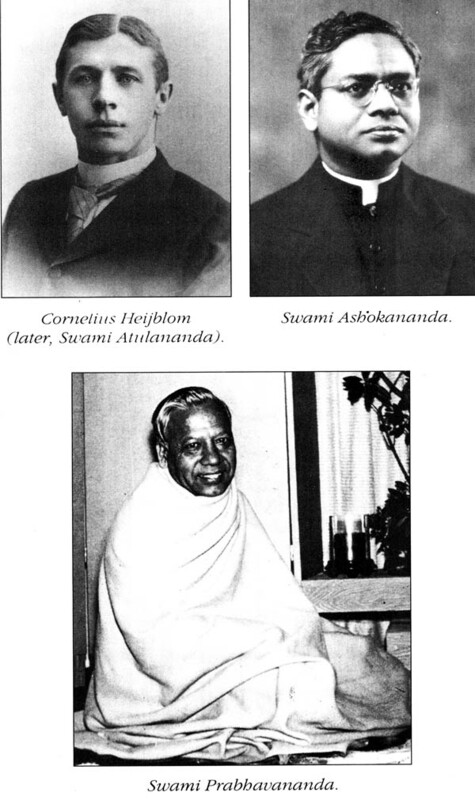 She was a great benefactor of the Ramakrishna Mission that her beloved mentor had established, and she was well known by most of the senior monks of the order, who too respected and cared for her. Moving among the elite in various parts of the world she was quite an influential person and she used her influence to further noble causes. Grand in appearance and imperious in will, she strode the earth like a queen, but her large heart melted at the sufferings of the poor and the deprived, to whom she gave with both hands, curtailing her own personal expenses and comforts. We have, therefore, great pleasure in placing before our readers this well-researched survey Josephine MacLeod and Vivekananda's Mission by Linda Prugh, who has meticulously cheeked all the available facts and painted a memorable word-picture of Swami Vivekananda's ministering angel. We are sure that this saga of Swamiji's Joe will inspire the reader to have a better understanding of Swamiji's great mission and the way in which all of us can contribute to fulfill his dream for the upliftment of humanity. 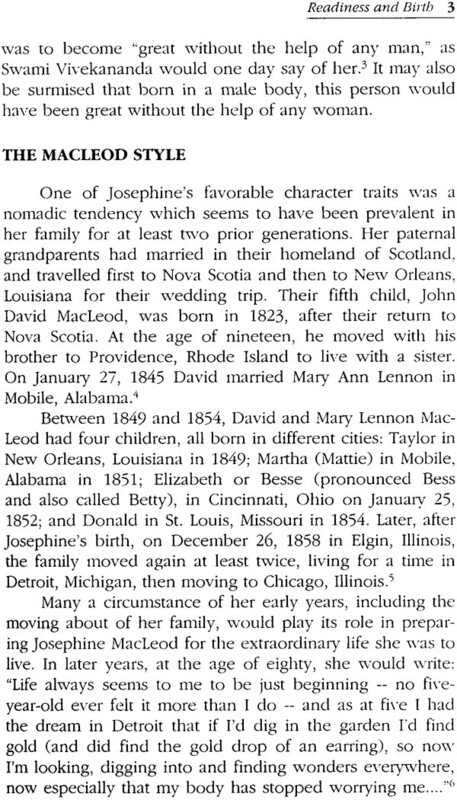 Josephine MacLeod was an aristocratic, cultured, liberal, idealistic, and spiritual American woman. She never married and was free from earthly ties and attachments. She had a tremendous passion for truth from her very childhood, and that made her free. 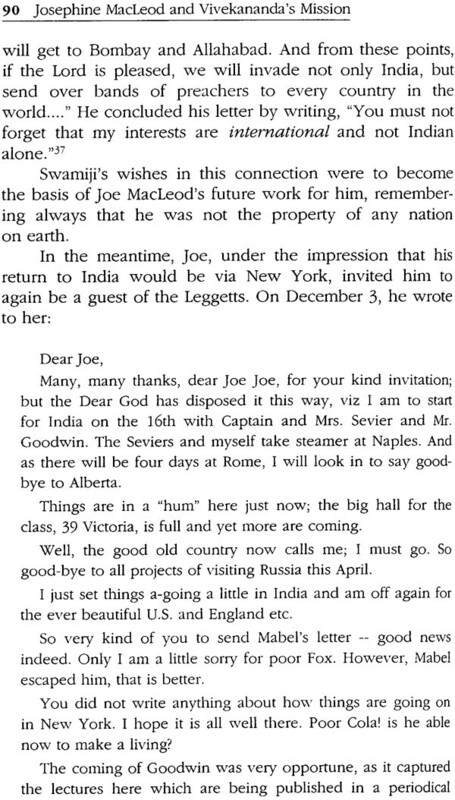 In New York City, on January 29, 1885, she went to hear a lecture by Swami Vivekananda. She later wrote: "He said something, the particular words of which I do not remember, but instantly to me that was truth, and the second sentence he spoke was truth, and the third sentence was truth. And I listened to him for seven years and whatever he uttered was to me truth." This encounter transformed her life. 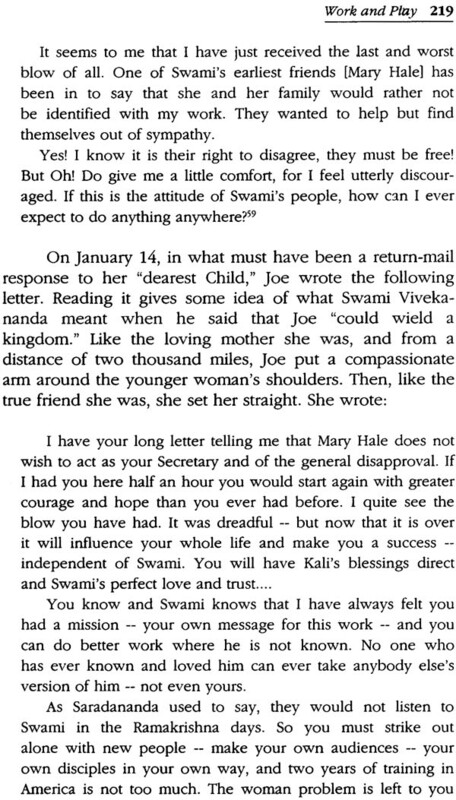 Joe became an ardent follower of Vivekananda and carried his message of truth until she died in 1949.
. And so tell yourself that incessantly. Til you get the courage that comes, know that there is this power within you as well as without." Thus Swamiji unveiled the divine nature of this American woman. Love and freedom are the two basis things that help human being to grow. Josephine MacLeod had both. She became a universal woman and a great lover of humanity. On September 1, 1986, at Rameswaram on the coast of the Indian Ocean, I heard a thrilling story about her from Swami Sarvajnananda, an old monk of the Ramakrishna Order. I taped his eyewitness account in which he stated: "Miss MacLeod generally spent six months in America and six months in India. She came to Madras another time [probably in the1930s], on her way to Calcutta. She took a taxi from the Madras harbour and arrived at the Madras Math about 1:30 in the afternoon. The shine was closed. The priest swami had already put the Lord to bed. Miss MacLeod said to Swami Sharvananda, the head of the Math, 'I want to go to Swamiji's room.' Swami Sharvananda politely replied: 'Swamiji is resting now. You will have to wait until 4 o'clock.' 'Nonsense!' said Miss MacLeod. 'Swamiji is resting! If he were alive he would have come to receive me at the port. And you say that he is resting! Please open the door right now.' 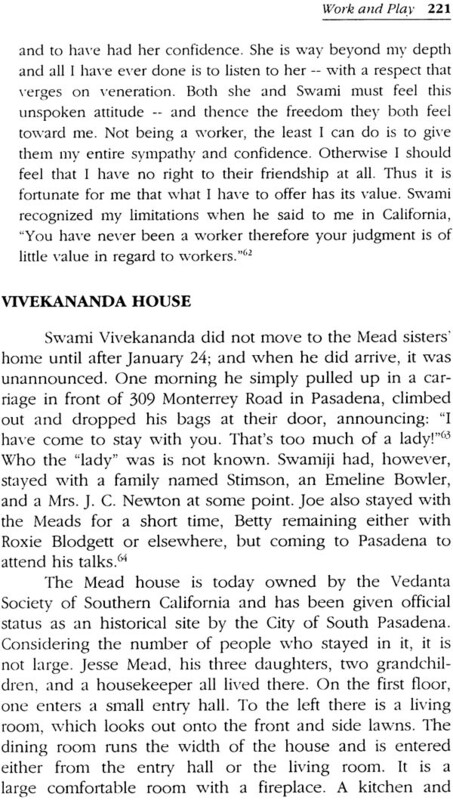 Swami Sharvananda asked a monk to open the door of Swamiji's room. I put Swamiji's picture on the pillow, and Miss MacLeod then sat on his bed with her eyes closed. After some time she came out and returned to the harbour." Hearing this story, I realized the power of Love. This American woman's genuine love had wiped out the orthodox rule of a Hindu monastery. Love is reciprocal. "I love the Yankees," said Swamiji. He gave his lifeblood to awaken their spiritual consciousness. The Americans, especially women, understood and appreciated Swamiji's spiritual power, unselfish love, pristine purity, burning renunciation, and universal message of Vedanta. 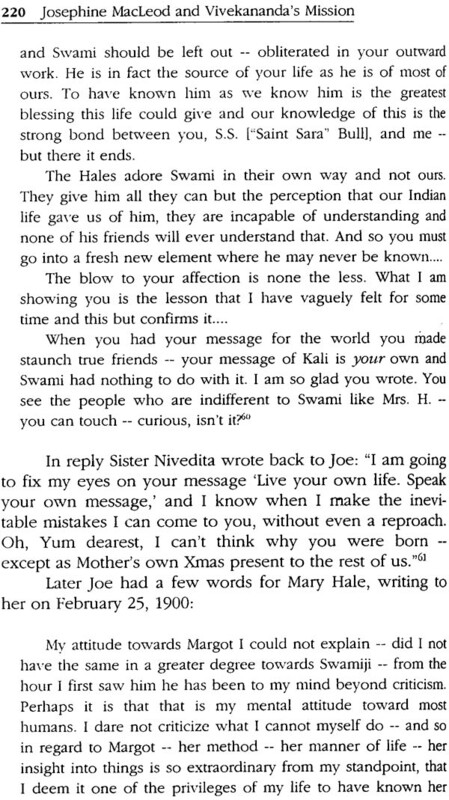 Sister Nivedita, an Irish disciple of Vivekananda, wrote to Joe on April 11, 1906: "You see, when we who understood Swamiji and remember him are dead, there will come a long period of obscurity and silence, for the work that he did. It will seem to be forgotten, until, suddenly, in 150 or 200 years, it will be found to have transformed the West." In her reminiscences, Joe recorded the last conversation she had with Swami Vivekananda, which took place at Belur Math in March 1902. She wrote: "He said to me, 'I shall never see forty.' I, knowing he was thirty-nine, said to him, 'But Swami, Buddha did not do his great work until between forty and eighty.' But he said, 'I delivered my message and I must go.' I asked, 'Why go?' and he said, 'The shadow of a big tree will not let the smaller trees grow up. I must go to make room.'" Vivekananda died on July 4, 1902. Joe was then in London. She cried for years, and at last this saying of Maurice Maeterlinck brought solace to her: "If you have been greatly influenced by anyone, prove it in your life, and not by your tears." 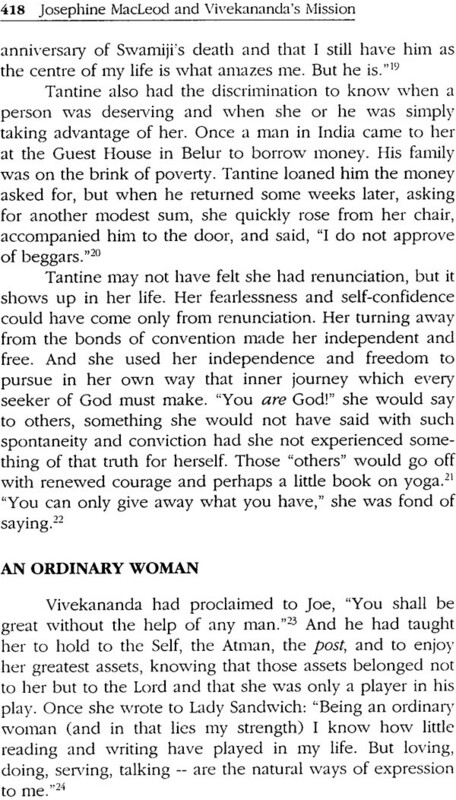 This book is a biography of Josephine MacLeod, but interwoven with it is Vivekananda's Vedantic Mission. One will find in this book religion, philosophy, and mysticism; manners, customs and cultures of the East and the West. Joe was a world traveler and she encircled the globe many times by ship. Her travelogues and descriptions of famous people and places all over the world are highly educational. Her all-encompassing love for humanity made her famous world-wide. She had an amazing personality, and she knew all types of people, from the king in the palace to the beggar on the street. In 1897 Vivekananda established the Ramakrishna Mission to serve human being as God. This book will tell readers how this American woman became a great instrument in helping and protecting the youngest, poorest, and smallest religious organization, the Ramakrishna Order. She lived for months at a time at the guest house of the Ramakrishna Monastery on the Ganges, and way very close to the disciples of Sri Ramakrishna. As her mind was saturated with the ideas and ideals of Swamiji, she inspired the Order's next generation of monks and helped many of them who came to the West. No history is complete. Thomas Carlyle said, "Biography is the only true history." Linda Prugh, the author of this book, worked extremely hard to research and document in detail the early history of the Ramakrishna movement in the West as well as in the East. 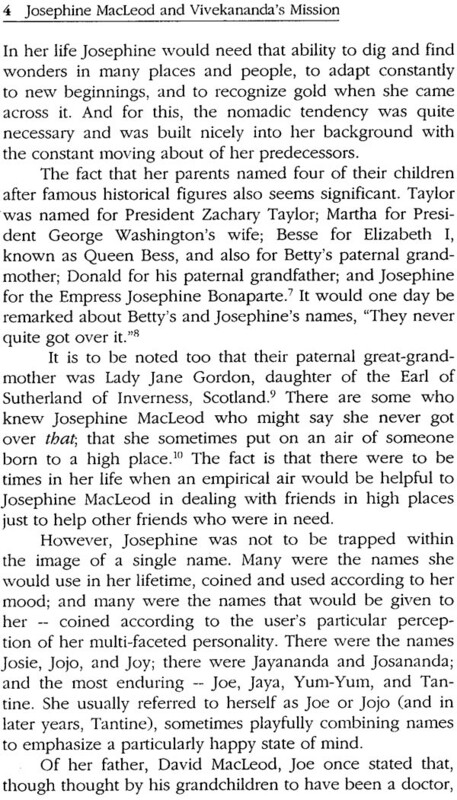 She meticulously examined hundreds of Josephine MacLeod's letters, and interviewed people who had know Joe. I have her manuscript and appreciate her sincere devotion to Vivekananda. Josephine MacLeod's life story forms one of the most important and lively chapters in the history of the Ramakrishna-Vivekananda-Vedanta movement. For seven years she followed Swami Vivekananda like a shadow, and for fifty-four years she disseminated his universal message of Vedanta through her international friendships. In his lecture "The Way to realization of a Universal Religion" Vivekananda said: "Not only must you have the spiritual ideas, but they must come to you according to your own method. They must speak your own language, the language of your soul, and then alone will they satisfy you. When the man comes who speaks my language and gives truth in my language, I at once understand it and receive it forever." 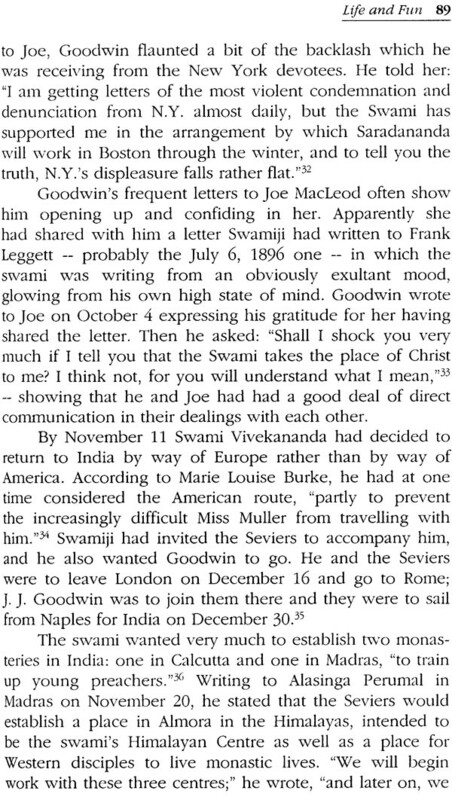 The first time Josephine MacLeod heard Vivekananda speak, she recognized truth and heard only truth for the next seven years. He spoke the language of her soul, and her life was changed forever. In turn Josephine MacLeod was able to speak to others in a charmingly natural way about Vedanta. "Being an ordinary woman," she once wrote, "(and in that leis my strength), I knew how little reading and writing have played in my life. But loving, doing, serving, talking  are the natural ways of expression to me." 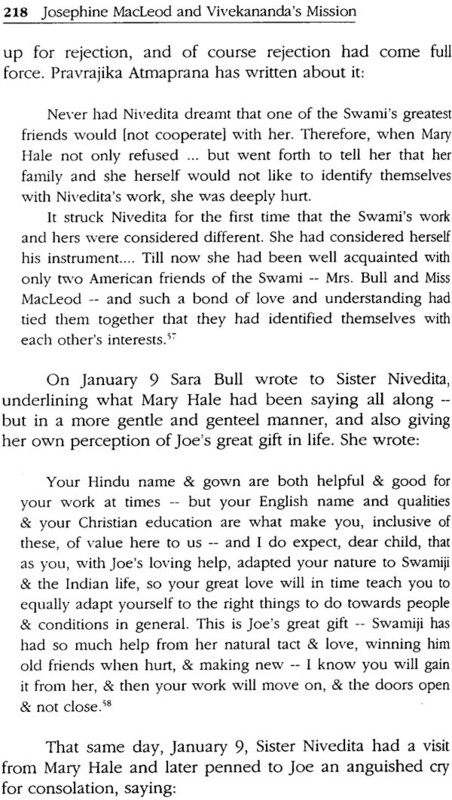 Some of Swamiji's most glorious praise and choicest blessings were expressed in letters to Josephine MacLeod. He also made a number of remarkable statements about her: He declared that she was "complete" before he ever met her; that she was the only soul among some devotees who had attained freedom; and that she was purity itself. He also referred to Joe as his "good star" and declared that she could wield a kingdom. Since 1984, when research on this project was begun, I have lived with Josephine MacLeod, and in turn, through her, with Swamiji. In this biography, I have tried to answer three questions that have from the beginning intrigued me about her: first, what prepared her to play the outstanding role she had in Vivekanada's great world mission and drama? Second, what made her the extraordinary person he saw? And, there, was she really his friend, not his disciple, as she always declared? Working on her biography has been a truly joyful experience, because from January 29, 1985, the day she first set eyes on Swamiji, her very life breathed Vivekananda and the pure, universal principles of Vedanda to an intoxicating degree. 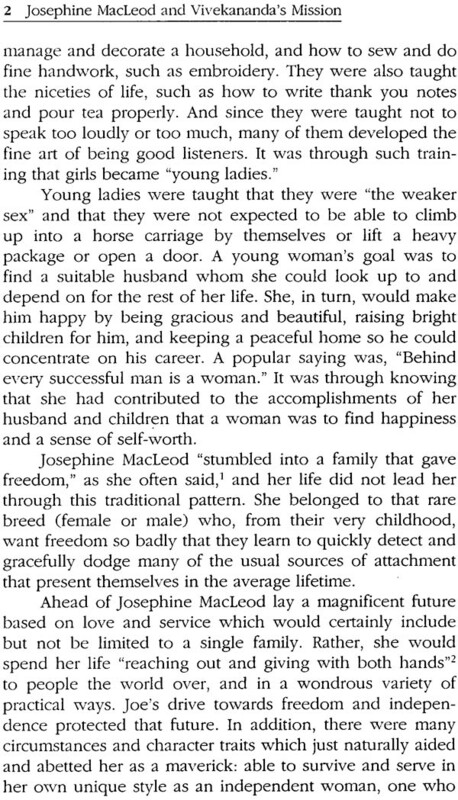 But even her early life, before she mate Swamiji, revels many clues as to why he saw such remarkable qualities in this "ordinary woman." " If you are ready," she once started, "when you are ready, the teacher comes. It's your readiness that calls him." Like Vivekananda, Josephine MacLeod tried to bridge East and West, and fearlessly made numerous ocean crossing even during the First World War, risking her life to do so. This brave, dedicated American woman was a lover and student of religious thought, philosophy, science, art, and literature. But over and above that, she was a great lover of humanity. Although she could have led a life of case in comfortable settings, her loving heart bled for those who had so little, and she preferred to live in simple surroundings, depriving herself of many comforts so that more of her money could be used to serve others. "Learn to give for the great causes," she once advised a friend. "Then give with both hands!" Josephine MacLeod was true citizen of the world, who genuinely cared about people. Monastics and householders, servants and savants, cabinet ministers and poets  she made fried with all. Perhaps this was due to the fact that instead of seeing "Easterners," "Westerners," or other such labels, she simply was more people to care about. "I am radiant and happy & don't want anything on earth but a few more people to love," she once wrote. 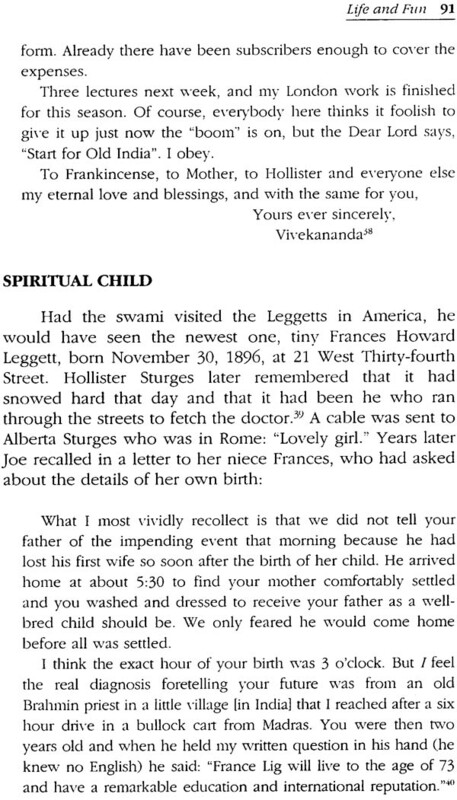 "Always remember," Swamiji told her, "incidentally you are an American and a woman, but always you are a child of God. That's your birthright." And because she took this teaching into her very heart, she believed in herself and could help others believe in themselves. She inspired others because she was genuinely inspired, and in her presence, people left great. In this natural way Josephine MacLeod gave life to Vivekananda's teaching to worship God in human beings, and to her very lost breath she was a vital agent of his mission just by being herself. She was also very practical. She instinctively knew when certain people should meet, and it was she who introduced Vivekananda to many thinkers, writers, artists, and scientists of the day whom she had met on her travels all over the world. Later, she helped young Ramakrishna Order swamis who are working in the West make contact with people who would help them. It was she who brought President Woodrow Wilson's daughter Margaret to meet Swami Nikhilananda, and later Margaret Wilson helped edit the swami's translation of the Gospel of Sri Ramakrishna. 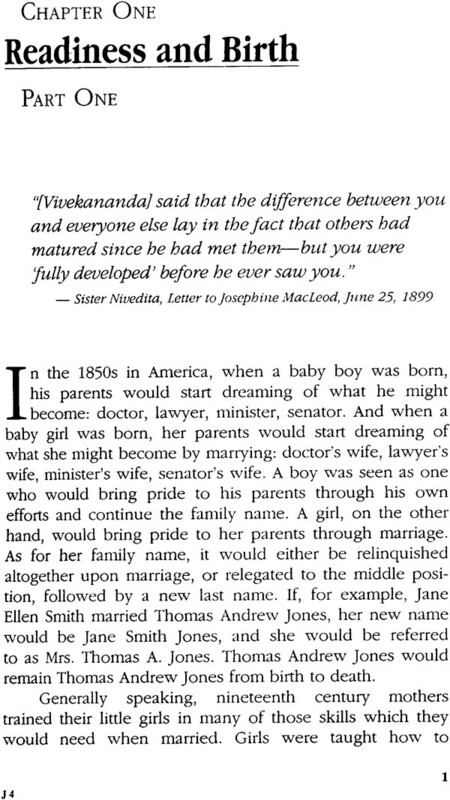 Joe MacLeod also devoted decades of time and energy to finding the right people to translate and publish Vivekananda's written works in a number of languages. Above all, her own enthusiasm for Vedanta and love of Vivekananda inspired both monks and devotees in the early days of the Ramakrishna movement. 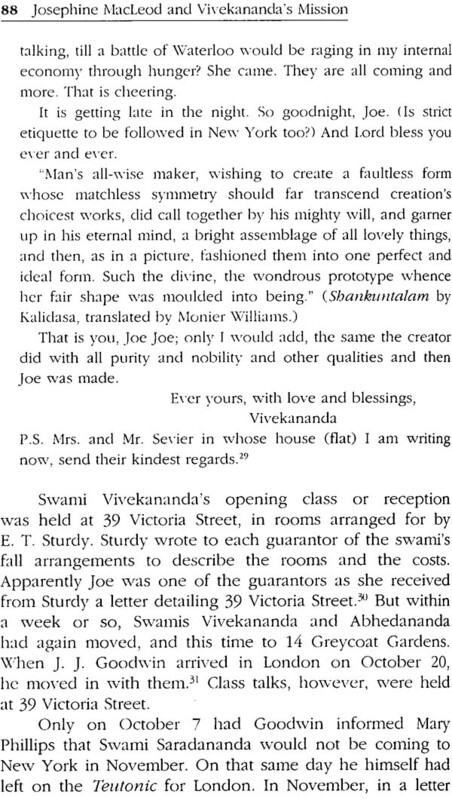 In many ways, Vivekananda and Josephine MacLeod were very much alike, and there was thus great openness and perfect communication between them. They understood each other and accepted each other implicitly. Truth and freedom were their watchwords, and the spirited attitude that Joe developed in her life gave her more freedom than many people today possess. Each of Swamiji's close devotees had a unique relationship with him. It was Josephine MacLeod's privilege to be sensitive to and care deeply about the personal, human side of the great swami. Perhaps more than any other devotee, she protected him by giving him privacy, freedom, and space. "Days without speaking, days and nights of continuous speaking," she recalled about time spent with him. "We followed his modes and dept ourselves busy in out own lives and happy when he wasn't about, so that there was no sort of weight put upon him." This sums up Josephine MacLeod's relationship with Vivekananda. Many people have helped me in this project, but my reverence and gratitude go first to my teacher, Swami Chetanananda, who from his very boyhood has loved Swamiji. From his inspiration came the idea for this book, research for which was begun in 1984; and from his encouragement came completion of the project nine years later. Another and gathering illustrations. Swami Chetanananda also kindly provided many photographs for publication. In addition, Swami Chetanananda made available to me two important collections of letters: the Elmhirst Collection (letters written by Josephine MacLeod to Leonard Elmhirst, noted authority on land use and founder of the famous Dartingtion Trust from in Tones England), and the extensive Friends Collection of letters written by friends of Vivekananda to each other. Swami Chetanananda also helped with many Bengali Translations, and he went through the manuscript and made valuable suggestions. 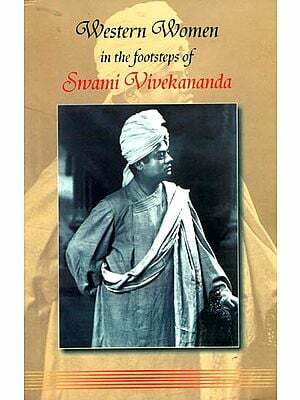 I also wish to express my deep gratitude to Swami Gautamananda, president, Sri Ramakrishna Math, Chennai, for publishing this book, and I am grateful to the following swamis of the Ramakrishna Order who have given me permission to use certain materials: Swami Mumukshananda, president, Advaita Ashrama; Swami Dayatmananda, Vivekananda Vedanta Society, Chicago; Swami Dayatmananda, Ramakrishna Vedanta Center, London; and Swami Swahananda, Vedanta Society of Southern California. In 1972 Frances Leggett, daughter of Francis and Betty Leggett and nice of Josephine MacLeod, donated a copy of her book, Late and soon: The Transatlantic Story of a Marriage, to the Vedanta Society of Kansas City library. That look reflected for me the deep imprints Swami Vivekananda had left of the lives of a family at the turn of the century. I had just become a member of the Vedanta Society, and reading Late and Soon marked the beginning of my deep interest in Swami Vivekananda and, in turn, anywhere he had been and anyone who had known him. One of the most helpful persons on this project has been Viscount Margesson, son of David Margesson and Frances Leggett, and great-nephew of Josephine MacLeod. 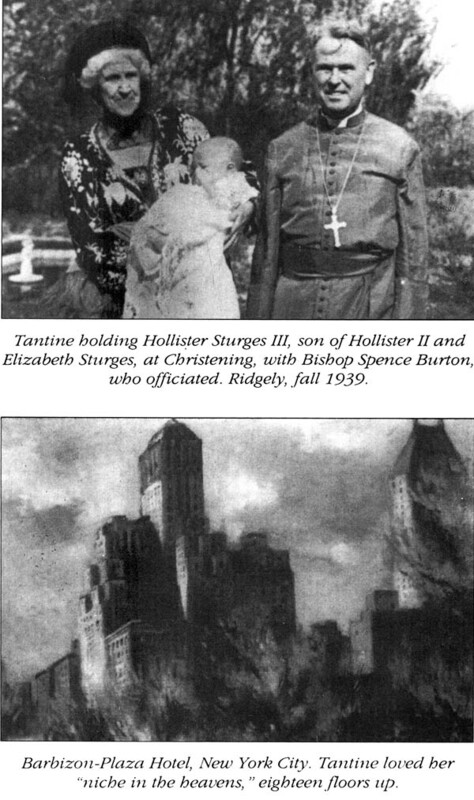 Lord Margesson and his wife, Helena, have lived at Ridgely in Stone Ridge, New York, since 1964, and he has been most generous with his time answering any questions about Ridgely, where Vivekananda stayed on three occasions, Camp Percy, where he stayed once, and other family properties. He has also generously provided many materials and photographs for this book. I am grateful to Anna Monday, a devotee in Berkeley, California, who very carefully edited this manuscript, raised a number of thoughtful questions, and offered many valuable comments. William Bergfeldt also read the final draft of this book and made a number of valuable comments. Marjorie Shepard of Kansas City was extremely helpful by translating long sections of Fresh works and correspondence. Others who have helped with translations have been Marte Aponte (French); and Jay Bhattacharyya and Shyam Ray (Bengali). My friend Nina Yaylor, of the Vedanta Society of Kansas City, has from the beginning been a great help in this project, cheerfully conducting a number of special searches that were necessary, and in general giving moral support. I am also deeply grateful to my friend Diane Marshall, of the Vedanta Society of Kansas City, for the Beautiful cover she has designed for this book and for all interior photo gallery layouts. My special gratitude goes to my husband, Bill Prugh, and my daughter, Niccole Prugh. Bill, a busy attomey, took the time to set up a personal computer for me, patiently taught me to use WordPerfect, and many times helped me with computer problems. Niccole took photographs when the three of us visited Ridgely in 1993, and three important artifacts are shown here for the first time: a meditation bench which Josephine MacLeod had made for Vivekananda, a special window which she had cut into a wall for Swamiji, and a large drawing of the famous Lalique reliquary, which Josephine MacLeod wore as a pendant. Finally, I should say that my research on Josephine MacLeod these many years became a theme of meditation on Swami Vivekananda. Both taught me, "My religion is to learn." May Swamiji bless us all! "The thing that held me in [Swami Vivekananda] was his unlimitedness! I never could touch the bottom  or top  or sides! "It is the 'truth' that I saw in Swamiji that has set me 'free.' One's faults seem so insignificant. Why remember them, when one has the Ocean of Truth to be one's playground? "I feel that Swamiji was a rock for us to stand upon  that was His function in my life. Not worship, nor glory, but a steadiness under one's feet for experiments!" Linda Prugh, the author of this book, worked extremely hard to research and document in detail the early history of the Ramakrishna movement in the West as Well as in the East." She is my good Star! Death in the Grand Manner:! Hold on to the Post!